Highlights and stories from the road. We’ve been getting lots of questions on how we travel with Lotus and what that entails for us and her. 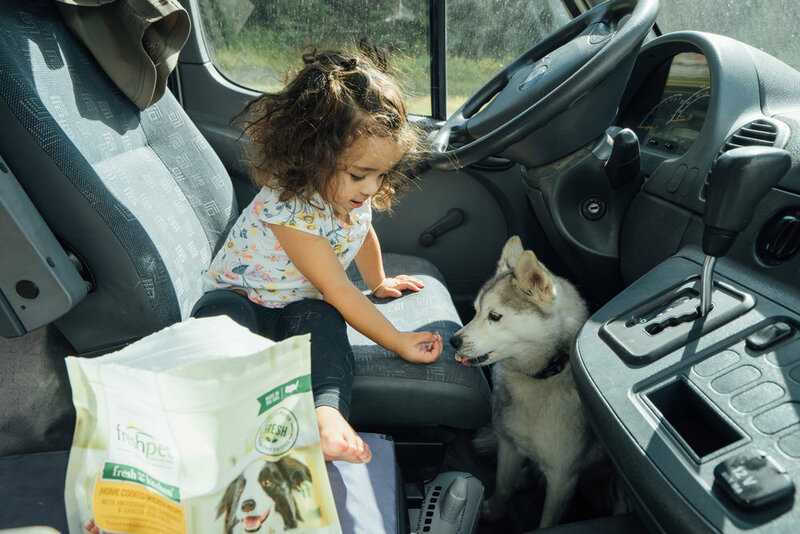 We’ve teamed up with Freshpet to shed some light on this little adventure dog’s life on the road! So here are the most asked questions! This post is sponsored by Freshpet! We are so grateful for their support and for keeping Lotus healthy and happy. Does she go into a kennel while driving or just roam around? Lotus is kennel trained but we’ve never put her in a kennel. She’s a lot smaller than most people think she is so van living is actually great for her and she hardly takes up any room. The van is basically her kennel. Does she bring in a lot of dirt? Does she shed? How do you wash her? ﻿Lotus loves rolling around in the dirt, sand and poop, so she gets really dirty. We do a lot of sweeping and actually have a small vacuum that’s amazing for dog hair. Lotus is from the husky family so you can only imagine how much hair is in everything. We’ve learned to live with her hair, it doesn’t bother us at all. Even when it’s in our food, you just pull it out and continue with life. We also have an outdoor shower that we can wash her in, but often times we take her to the local dog groomer. What food do you feed her? She is currently being energized by Freshpet! Their food is farm raised so we know she gets all the good and healthy things a dog should have. Lotus is extremely picky. There are some foods she won’t touch which we feel is her dogs senses maybe telling her that has something nasty she should not partake of. She LOVES Freshpet foods and if we let her, she would probably eat an entire bag. We are actually dog food snobs and want our dog to eat the best, not junk that will eventually cause health problems so we are pretty particular about what she eats. If you guys are interested in trying something for your dog that’s whole foods and natural products check out Freshpet! What do you do when you can’t take her somewhere with you? How easy is it to find dog friendly places? How long do you leave her in the van if necessary? We usually don’t go places that don’t allow dogs. Even with restaurants, we make sure they have outdoor seating so she can sit with us. Finding dog friendly places isn’t too difficult, we ask around or just use google. People with dogs usually know all the hot spots for dogs. We typically don’t go somewhere if it doesn’t allow dogs. We are dog people and would rather she’s just as comfortable as we are and joining us in all the fun. We haven’t explored National Parks as much as we would like to because of having to leave her in the van but it’s a sacrifice we are willing to make. She is our family and we love having her with us (even when she rolls in poop). If we do leave her in the van it’s usually because it’s not a hot day and she’s going to be ok. We leave her with plenty of water and food. She also doesn’t bark. We’ve heard her bark maybe 1 time in the 4 years we’ve had her (she howls). The van is her home so she also feels safe. If we leave her in the van she just sleeps. The longest we’ve ever left her in the van is like 2 hours to do a hike at a National Park on a rainy day. She sleeps in the front seat, drivers seat. She used to have a bed but she finds comfort in sleeping where Jace has been. If she was a cuddler, we would probably let her sleep in bed with us but unfortunately she is not. What is the relationship between Juniper and Lotus? Lotus does not like children. If she sees a child nearby she will run away in a second. But Lotus tolerates Juniper. Every morning Juniper will visit Lotus in the front seat and love on her. Lotus doesn’t love it, but she doesn’t try to get away from Juni, and we believe it’s because she knows Juni is her family and isn’t going to do any harm to her. We like to think Lotus is the teenage sister who can’t stand her little sister but still loves her to death. We are super lucky to have such a rad and easy going dog. Our advice is that no matter where you are, you’re dog will need to learn to live around what environment they are in. Whether you are in an apartment, house with a backyard, or a van. All these guys care about is having a companion to love them and to love back. Many people are drawn to “vanlife” because of the freedom of mobility it offers. If its too hot, you move to a new location. If its too cold, start driving. It is honestly how we decide where we are headed next. My Dad jokes that we “don’t travel by compass or gps, we travel by thermometer.” - He’s right. We are excited to begin this blog and adventure and to share our experiences with all of you guys. This lifestyle is a dream made into reality.